This process can appear disjunctive to non-scientists. An experiment can be performed, make headlines, and then be virtually forgotten by the general population, until years later it is used to form the basis of some other experiment or breakthrough. Scientific knowledge builds upon foundations laid by earlier scientists. For instance, a lot of people think of global warming as a recent concern, but the history of the science goes all the way back to around 1820. To provide context, as the Romantic poets you read about in English class were writing about nature, love, and Grecian urns, a small handful of scientists were thinking about the earth’s atmosphere, how it worked, and how human activity might be impacting it. This is not a thorough review of all the major climate change scientists, nor is it even necessarily a list of the most important, but I hope it will show you how scientific discoveries most often stem from earlier scientific discoveries, and how these different pieces of knowledge fit together to form a body of knowledge. Back in the 1820s, a French scientist named Joseph Fourier asked a really important question that apparently no one had thought to pursue before: “What determines the average global temperature of a planet like earth?” In other words, if light from the sun comes down to earth and warms it up, that’s great, but why doesn’t it just keep on heating up? His theory was that when the light hits the earth it turns into infrared radiation and bounces back into space. But when he tested it and ran the numbers, he found that the earth should be well-below freezing. So he realized that he had to go back to the drawing board. And that is the scientific method in a nutshell. You come up with a theory, test it, and review the results. If the results do not back up your hypothesis, then you try something else. But if they do, then you are onto something, The next step is that you make those results available for other people to replicate, study, pick apart, argue about, and improve upon. This is called PEER REVIEW. And because it is a really important concept, I will rephrase it: that’s when you make your results available to the community of experts in your field, then they double check your work to make sure that you have reported everything accurately and that your experiment actually corresponds to your hypothesis. So when Fourier’s hypothesis came back null, he researched it more and figured out that he had not considered the effect of the earth’s atmosphere, which traps a portion of the heat radiation in and keeps it from bouncing out into space. This is known as the greenhouse effect, but no one was talking about that yet. In 1859, a scientist named John Tyndall, likely drawing on Fourier’s earlier observations, became the great, great grandfather of global warming. He asked the question, “How does the atmosphere affect temperature?” The prevailing science of the day sort of assumed that all gasses were transparent and that heat radiation would pass right through them. he tested this theory with several different gases. Everyone got a good laugh. The industrial revolution had brought great progress and riches to the world, and so the last thing people wanted to think about was turning off the power plants just in case the relatively few smokestacks would one day cause unspecified problems at some unspecified time way, way, way in the future. So his findings were widely ignored. Besides which, to crunch the numbers and see exactly how it would play out was far beyond anyone’s capabilities back then. You would need computers to run all those numbers. Besides which, even if you could measure the amount of CO2 in the air in one place, it could change minute to minute if there was a breeze, or rain, or a campfire, or a group of people standing in a line doing jumping jacks, or anything. It seemed pretty hopeless. Understanding this complexity a bit more than others of his time, a geologist named TC Chamberlin developed a theory of climate change and was one of the first to emphasize carbon dioxide as a major regulator of Earth’s temperature, thus anticipating modern global warming. He was looking for a way to explain glaciation and hypothesized that that ice ages might follow a cycle driven by feedbacks involving CO2. He recognized that the only way to understand climate was to understand almost everything about the planet together — not just the air but the oceans, the volcanoes bringing gases from the deep interior, the chemistry of weathered minerals, and more. So he was pretty ahead of his time. Then in 1935 or so, there was an engineer named Guy Callendar, who had noted that temperatures around the globe had been warming. His hobby was weather statistics. That was his hobby. My hobby is comic books, and that makes me feel pretty dumb. He blamed CO2 for the rise in temperature. The idea was met with some skepticism, because, you know, the world is so big, and how could human industry possibly affect something so big? A couple of decades later, right in the heart of the Cold War, through a long and complicated series of events best summed up as: the pentagon wanted to see if we could manipulate weather to destroy Russia, a scientist named Gilbert Plass began studying CO2 on a new invention called a computer (which at the time was about the size of this room). Being part of the military complex, he had access to many of them, which was necessary given the kinds of computations he was making. He had been intrigued by Chamberlin’s approach and finally had the means to test it a bit. After all the number crunching, in 1956, he came out and said that raising or lowering the amount of CO2 in the atmosphere could affect climate by reducing or increasing the amount of heat radiation that was escaping into space. He stated that human activity at present levels would raise the average global temperature about 1.1 degrees C per century. After he made those results public, other scientists quickly shot them down because his computations were crude and did not include a lot of possibilities (e.g. : changes in temperature would increase the amount of water vapor in the air which would in turn trap more heat, and so on…). And answering questions like that would take way much more computing power than they had back then. Time passed, many other scientists worked in the field, created new models, employed advanced technology (such as radiocarbon dating), built satellites, studied their observations, and wrote, reviewed, and published articles about the climate and climate change. So we get to skip a few years. By 1977, the National Academy of Sciences reported that catastrophic changes in climate could be on the horizon. They didn’t tell people to stop driving or turn off the smokestacks or anything like that, because they recognized that there was still a lot they did not understand. However, they were fairly certain that there was a direct correlation between energy output and global temperature. About that same time, there was a scientist named Ed Lorenz, a chaos theorist and student of “strange attractors.” He was the guy who said that a butterfly flapping its wings could lead to a hurricane a thousand miles away. 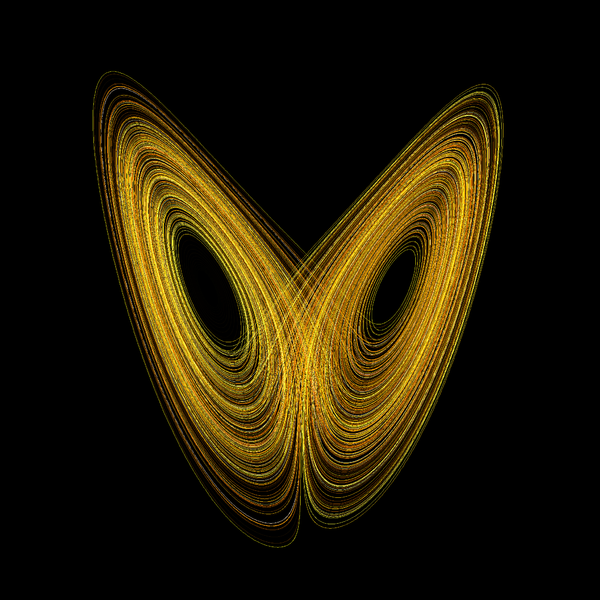 When I find the right tattoo artist, I am going to get a tattoo of the Lorenz Attractor, which is a computer-generated model of differential equations having to do with his study of atmospheric convection (ie. Temperature differences in the atmosphere). Curiously, the model turned out to be roughly the shape of a butterfly, which (awesomely!) was a product of random math, not of his design. But the main thing he did in the world of climate science is make everyone realize that it is all a lot more complicated than previously imagined, so computer models would have to be equally complicated. So many other teams worked on computer models that became increasingly more complex. The scientific method was repeated over and over again. Around that time, NASA scientist James Hansen appeared before Congress to warn them about global warming. He stated that, among other problems caused by global warming, the future would probably hold extreme events like summer heat waves… and the likelihood of heat wave drought situations in the Southwest and Midwest. He also pointed out that the case was strong that if we put any more than 350 ppm of CO2 in the atmosphere then we would risk the worst case scenarios of climate change. This year we passed 400 ppm. So climate change was becoming more public. Naturally, newsmedia wanted to cover this story, and often they did so in the format of debate. But because scientists who were both experts in the field and who disagreed with Hansen’s assessment were kind of hard to come by, they started pitting scientists against economists and politicians. This helped muddy the waters and make it seem like there was legitimate debate when there really wasn’t, if for no other reason than economists and politicians were often much better at public debates than research scientists. At the same time, because the scientists were starting to point at specific industries as causes for rising CO2 emissions, and because those industries have friends in government, global warming moved from the realm of science into the realm of political debate. Just as scientists were starting to approach consensus on the effects of CO2 on the atmosphere (at present around 97% of scientists publishing in the field are in agreement that humanity is driving climate change) certain industry leaders and their politicians were lining up against it. In group think, the group settles on a favored theory or belief and then unconsciously protects it. They avoid dissenting opinions and they ignore opinions that are contrary to their beliefs. But is that really the same as consensus? Doesn’t the scientific method itself guard against this phenomenon? If I had to sum it up in a couple of sentences, I would say: Scientific consensus demands an adherence to established rules through which decisions are made and ideas are either rejected or advanced. Though certain lines of thinking are ignored, it is not because the participants want one outcome over another and don’t want to rock the boat, it is because those ideas have been eliminated through the process of science and don’t need to be considered any more. The text is likely to change in response to comments from government and expert reviewers. It is therefore premature and can be misleading to attempt to draw conclusions. Draft reports are intermediate products and do not represent the scientific view that the IPCC provides on the state of knowledge of climate change and its potential environmental and socio-economic impacts at the conclusion of the process. We see from this statement the exact process of science. To get to the point where we are today, scientists had asked questions, do background research, construct hypotheses, test their hypotheses, analyze data, draw conclusions, and then subject those conclusions to review by their peers. So, when scientists talk about consensus, it isn’t a popularity contest or something they just decided to agree upon. The consensus on global warming has come from a roughly 175 year history of scientists doing what scientists do. To suggest otherwise seems at best disingenuous and at worst dishonest.